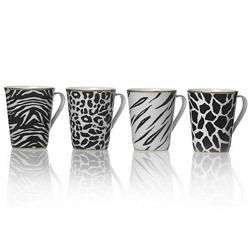 This Mikasa Color Studio set of Animal print Zebra, Leopard, Tiger, Giraffe mugs in black and white will go with anything on your table. Mix and match these animal patterns with a variety of other colors to create a delightful table setting. It makes a great gift too! You can match it with the Animal Print Black and White accent Plates.